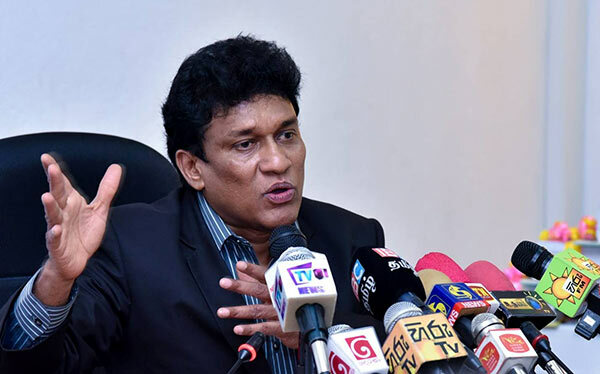 The national issue could be resolved 50 per cent by teaching Sinhala and Tamil to students, National Integration, Reconciliation and Official Languages Minister Mano Ganesan yesterday said. He was addressing the gathering at the ceremony presided by President Maithripala Sirisena at the Sugathadasa Indoor stadium. The ceremony was held to appreciate the students who achieved distinction passes for Sinhala and Tamil from the “If you know, teach, if you do not know, learn” radio programme 2017 organised by the National Integration, Reconciliation and Official Languages Ministry. He said the attempts taken by the Good Governance Government to make the students learn the official languages was fruitful. “Last year, 12,753 students had followed the language teaching programmes and this year, over 15.000 students are learning the programmes,” he said. Minister Ganesan said Sri Lanka does not have a national problem. “I was given an opportunity by the President and the Prime Minister to resolve the issue,” he said. He said the Constitution must be changed to address the national issue. The Minister said 7,565 students followed the learning programme in 2016 and 3,575 students were lauded at the ceremony for their grand achievements at the examination. He said many students would follow the programme next year and the ceremony to appreciate their achievements would have to be held at the Gall Face green. Prime Minister Ranil Wickremesinghe, National Integration, Reconciliation and Official Languages Deputy Minister Seyed Ali Sahir Mowlana and Minister Arjuna Ranatunga were present.